I don’t want to toot my own horn, but I’m kind of a chocolate expert (toot toot). My credentials don’t go beyond the fact that I eat A LOT of chocolate, but believe me; I know what I’m talking about. I’ve seen these Endangered Species Chocolate bars every time I go to the grocery store and I thought it was about time I tried some. Yes, not just one, some. You can probably tell by the brand name that Endangered Species Chocolate has something to do with endangered species. 10% of net profits go to species conservation, habitat preservation, and humanitarian efforts. Currently the donations go to the African Wildlife Foundation and the Xerces Society. But that is not the only great thing this company is doing. They are Rainforest Alliance certified (ethical business standards), USDA Organic certified, and 30% of the packaging is made from recycled materials. 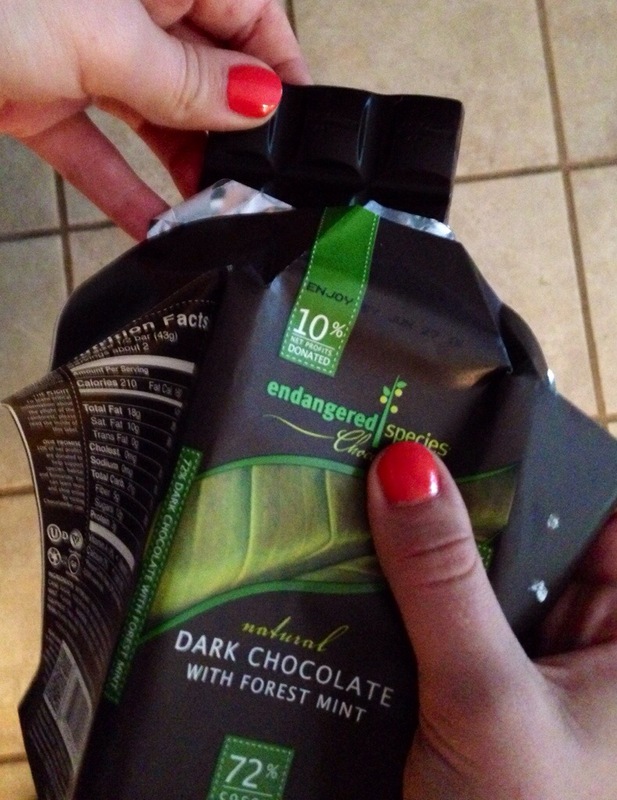 Endangered Species Chocolate also tackles a problem I wasn’t aware of: palm oil. Below you will see the impact conventional palm oil production has on the world. Endangered Species Chocolate uses Agropalma, which is a certified sustainable palm oil committed to zero deforestation. So after hearing all of these great things, the real question here is, is the chocolate good? And the answer is yes. Dark Chocolate with Espresso Beans: I was a little surprised by how much I liked this one because I’m not usually drawn to coffee flavors. The sweetness of the chocolate and bitterness of the coffee compliment one another very nicely. 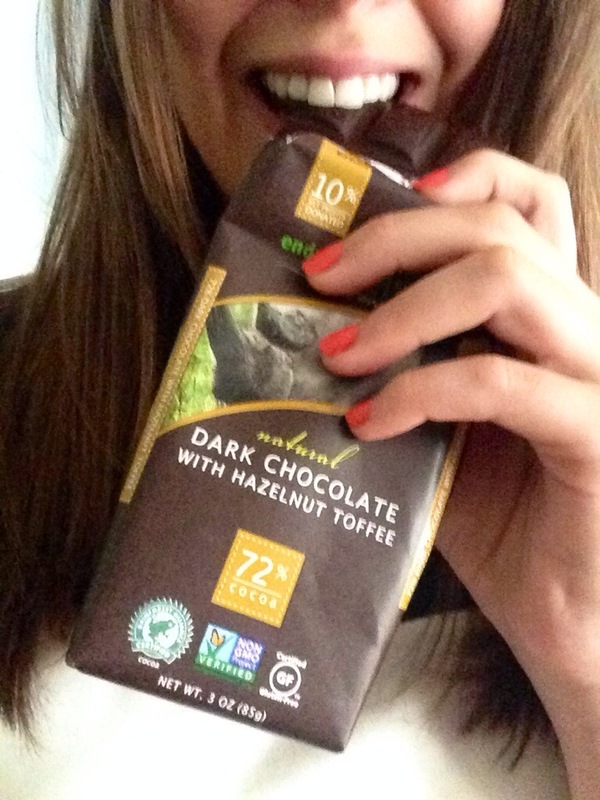 Dark Chocolate with Forest Mint: This one was a close second. The mint flavor is subtle, but adds another dimension to the smooth, rich dark chocolate. I really like that the mint flavor is natural and doesn’t taste overly sweet or artificial. Dark Chocolate with Raspberries: I will admit the raspberry flavoring isn’t very predominant, but the pieces of raspberry do add extra sweetness. I think this bar would be great for someone who normally indulges in sweet milk chocolates, but likes to mix it up with dark chocolate once in a while. Dark Chocolate with Hazelnut Toffee: This one has so much potential! The sad part is that the toffee bits are few and far between, but when you get a piece with a good amount of toffee in it, it’s goooooood. Dark Chocolate with Blueberries- I may be a little biased on this one. Being from Maine (the leading U.S producer of wild blueberries) I have high blueberry expectations. Chocolate covered blueberries are sold by the carton up here and I was a little disappointed in the low blueberry to chocolate ratio. Dark Chocolate with Cranberries and Almonds: This is the only one I was actually disappointed with. The almond pieces are very, very tiny. Normally when I crave chocolate with almonds I’m looking for that extra crunch. You don’t really get that with these little shreds of almond. The cranberries add a little bit of flavor, but like the almonds, are very small in size. There are a lot of other flavors available, but I had to limit myself to six. You can check them all out at the Endangered Species Chocolate website. If you try a flavor I didn’t get a chance to review, I would love to hear what you think! Categories: Uncategorized | Tags: Animals, candy, chocolate, Dark Chocolate, Endangered Species, Food, Lifestyle, organic, Rainforest | Permalink.